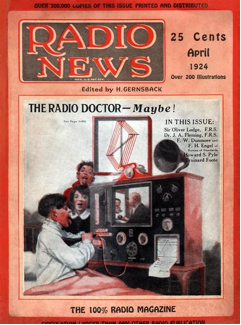 The cartoon that graced the cover of the April 1924 edition of Radio News depicted a physician linked to a patient only by sight and sound i.e. the Radio Doctor. The term Telemedicine first appeared in the medical literature in 1950 after radiologic images were transmitted by telephone; a distance of 24 miles from West Chester to Philadelphia, PA. Fast forward to the 1990’s, with the rise of the internet, came the birth of the necessary framework for telemedicine to grow. This framework allowed for innovations including the development of electronic medical records (EMR) that could be effortlessly shared. Jeff Bezos, the founder of Amazon, is one of the fathers of e-commerce. He envisioned something beyond the brick and mortar bookstores and the traditional method of book sales. He left his job as an investment banker and drove to Seattle to start Amazon. As health care providers, we should ask ourselves in today’s world of medical practice is there a similar opportunity with telemedicine. The growth of telemedicine has been spectacular. Kaiser Permanente, the largest care organization in the US, has about 52% of their more than 100 million patient encounters as virtual visits. A retrospective analysis involving 19,246 consultations showed not only savings in cost and travel but also that telemedicine is “green” for the environment with a measured 1969 metric tons of carbon dioxide saved. Of course, an additional advantage is that the patient is able to avoid long wait times. There is even a telemedicine advocacy group called the American Telemedicine Association founded in 1993 with over 10,000 members. Multiple “techy” health conferences are available to attend. Telemedicine typically is used via three modalities including 1. real-time (or live video), 2. asynchronous (store and forward), and 3. remote patient monitoring. Real-time telemedicine is an online-based audio-video consult. However, technology has developed to move this modality forward. Need to remotely auscultate the heart? A patient can hold a device like the Alivecor KardiaMobile EKG monitor or the iPhone-sized Eko Duo over their chest and it will record heart sounds and an EKG tracing. The sounds and tracing are uploaded to the EMR and transmitted to the remote physician for review. What if medical care is needed in an area difficult to travel to? Unmanned drones have been used to deliver medical supplies and interface equipment for a physician to treat these distant patients. This is already being done in the rural USA. A provider using asynchronous telemedicine receives information for analysis first prior to responding to the sender. The hope is for better evidence-based medical recommendations. The patient or the primary care provider also have the option to discuss the case with the specialist at a convenient time. This removes the difficulty of multiple appointments and schedule conflicts. A hybrid of both real-time and asynchronous telemedicine is Project ECHO (Extension for Community Healthcare Outcomes). New Mexicans with hepatitis C were going untreated because there were no nearby specialists. Dr. Sanjeev Arora, a hepatologist in Albuquerque, saw an opportunity and created Project ECHO. Local clinicians would meet with specialist teams via virtual clinics and present patients and receive medical advice (real-time). This medical advice was then used to treat the local population (asynchronous). Project ECHO-trained clinicians had similar outcomes to that of university-based specialists. Project ECHO today has expanded over multiple specialties all over the world. Remote monitoring has made expertise care more available. One example is the telemedicine ICU where an intensivist oversees the care of a critical patient remotely. The boom of wearable devices introduced interesting opportunities. Need an example? A vest using radar technology gathers data detecting changes in lung fluid content that is sent wirelessly back to the medical provider. This device was show to help reduce readmissions rates in heart failure patients. What about Telenephrology? It has been looked at from the management of Chronic Kidney Disease (CKD) to kidney transplantation. The Zuni Telenephrology Clinic experience in management of CKD described bringing specialized nephrology care to a rural area. In transplant it has been shown that remote living donation and recipient screening increases access to care. This could even be used to battle disparities in kidney transplant as transplant education can be provided in another avenue i.e. a home visit for the patient with the provider at their office. What barriers exist? The health industry is in general slower to digitalize than other industries. Where else do you see a fax machine? Financially, Medicare, Medicaid and private payers do reimburse for telemedicine but it can vary dramatically. In the US to help overcome this, the Creating High-Quality Results and Outcomes Necessary to Improve Chronic (CHRONIC) Care Act of 2017 was passed. This bill directly affects the Nephrology community. Medicare’s requirement for monthly visits for home hemodialysis patients would be met if there is a face-to-face meeting every 3 months and monthly telemedicine visits in between. Another glitch in the US is using far away providers not licensed or credentialed in the patient’s state, one solution is the interstate Medical License Compact (IMLC) which is an agreement between 22 states and 29 medical and Osteophatic Boards in those states allowing physicians to practice across state lines. Though these issues exist, Telemedicine and health technology is a locomotive train with plenty of steam going forward. In 1995, Newsweek published an article written by Clifford Stoll on why the internet would fail. He said that the internet would not replace the daily newspaper, a competent teacher, or the way government works. Though we might smile at such a thought today it was 1995 and Google was not even born yet. Guess it is a good thing Jeff Bezos did not listen to Newsweek. There is and always will be a role for the traditional delivery of health care but telemedicine is advancing and evolving quickly. It is here to stay, almost a 100 years later I think we can say “the Radio Doctor is in”. Transplant Nephrologist. MedStar Georgetown Transplant Institute. My first post to the RFN blog; a review of the recent advances in Membranous Nephropathy. Discarding the use of unproven therapies:Let’s start questioning our habits. Hey there fellow electrolyte enthusiasts! Come see my latest post at the Ins & Outs Blog on a pediatric approach to hyperkalemia in babies! Here is my 2nd post on NephJC- Neph Stats. This is a tremendous learning experience for me working with Perry Wilson! Many thanks to Neph JC team for giving me this opportunity. This piece only covers a few of the many examples of the interaction between nephrology and obstetric medicine. The ASN just announced their public policy interns for 2018 and NSMC Intern Lekha Tummalapalli was named. Congratulations. She is actually continuing a tradition as Scherly Leon, part of our first class of interns was also a public policy intern. I saw this really interesting case towards the end of my first year of renal fellowship. It was actually a curbside consult from a medicine attending, but turned out be a great learning case and made my weekend call very rewarding! I wrote a blog post on food insecurity as my first assignment for the NSMC 2018. It’s a topic that I feel passionately about, and think is under-recognized (especially in chronic disease in pediatric patients).